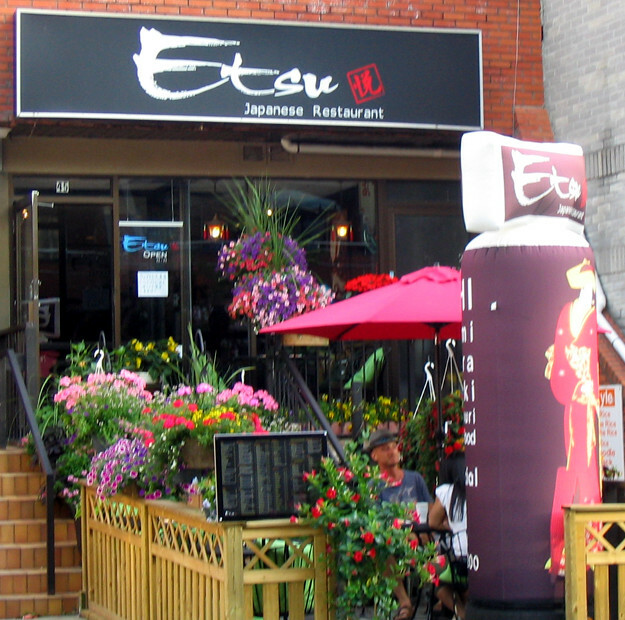 Etsu is located on the restaurant strip of Baldwin Street, located just north of Dundas between McCaul and Beverley. 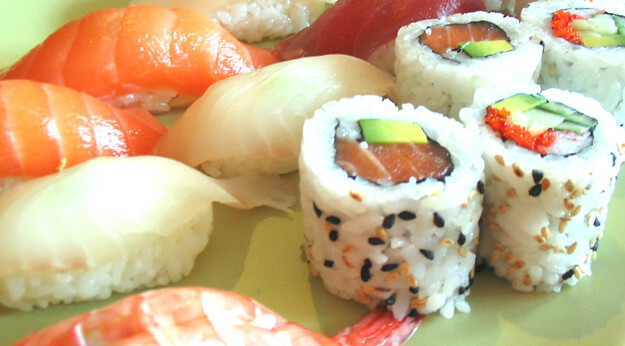 It is one of at least a few sushi places that call Baldwin Street home. Please read our conversational review, below. We noticed this place as we left the Fujiyama Restaurant which is basically right next door. Etsu has a much newer, modern look to it and we had planned to try this place next. As it turned out, we also got an email recommendation to try Etsu out. It became obvious to us that that Etsu would be our next stop. I arrived around 6pm and was the only customer there. It probably didn’t help that the G20 was getting under way so downtown Toronto was a lot quieter than normal. Indeed… For our entire meal, except for the last few minutes, we were the only ones at Etsu. The restaurant is quite nice inside. It’s fairly modern with art on the wall and what is likely CBC Radio playing on the stereo. The waitress was dressed in traditional Japanese wear. Outside it’s nicely landscaped with bushes and flowers. Visually, Etsu earns full marks. They’ve really done a nice job to make it a very comfortable place to enjoy sushi. Outside, among the landscaping, there are a few patio seats to enjoy if you don’t mind being too cramped. Personally, I wouldn’t want to sit at those patios seats right at the entrance. Very narrow and to me just a weird spot. Anyways, have to agree with you about the place though. Very classy, even with chopstick holders! Perhaps the best was the sushi chef staring at his laptop in the back table! Not sure what it is on Baldwin but so far, both places the sushi chef must be addicted to the internet or something! Hehe… Maybe there’s a Baldwin Street wi-fi network! Who knows, the but sushi chefs on Baldwin are definitely ‘online’. Let’s hope they’re not looking up ‘How to prepare sushi‘. 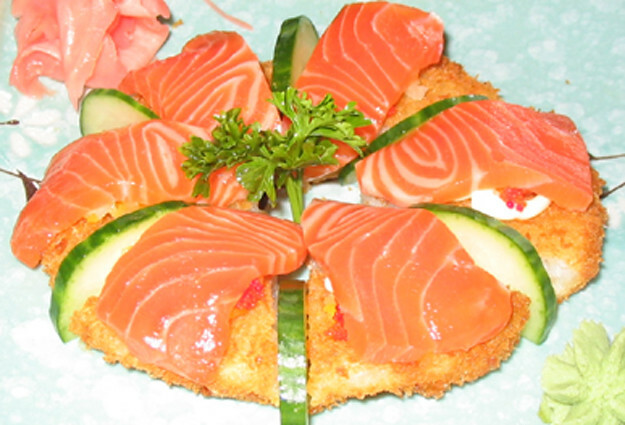 So, we decided to order the sushi pizza (of course! 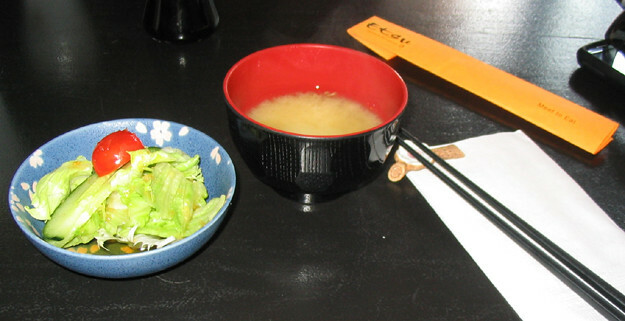 ), a dish of spicy rolls (various) and a dish of nigiri with a few rolls added in. Don’t forget their signature Etsu Roll. After all the times we’ve ordered the restaurants own named roll, one thing that seems to be consistent among them is that they are always one of their more expensive rolls! By adding their name to a roll, they also add a couple of bucks to it as well. Goes with the territory I guess. Oh well, as expected, the dishes came out pretty quick (since we are the only ones there). First out was the sushi pizza. 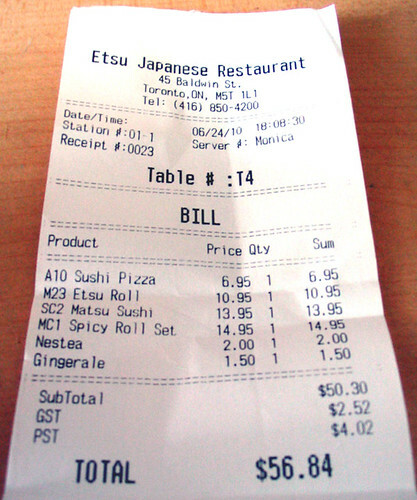 How could I forget the Etsu Roll!… Actually I wish I could (more on that in a bit). The sushi pizza was decent. Not bad at all. Next up was the nigiri dish, from what I recall. It wasn’t awful but not great either. They were both okay but nothing special or memorable to mention. 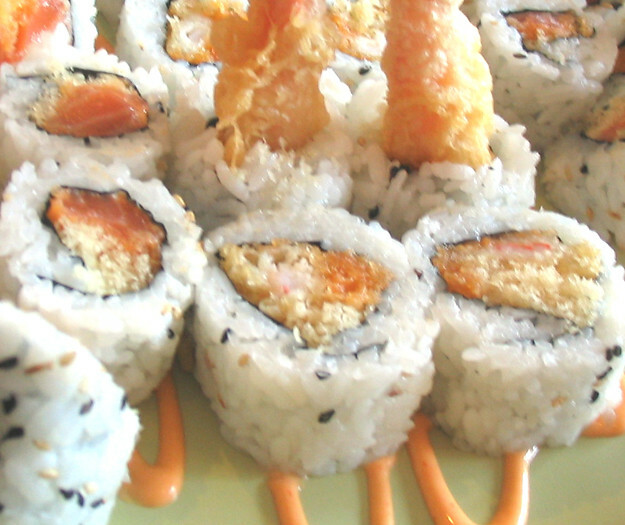 The spicy roll set (spicy tuna, spicy salmon and spicy shrimp tempura) came out next along with the Etsu Rolls. The Etsu rolls were okay but I really didn’t like any of the spicy rolls at all. They seemed too salty and had way too much rice. I was very disappointed by the spicy rolls. I don’t think I can remember a time where they’ve ever been that bad at any of the other places we’ve been too. True, the spicy rolls are usually a staple we can depend on. Not at Etsu. Agreed on the ‘too much rice’ comment. They simply were not good. We rarely leave sushi uneaten — especially not spicy rolls — but this time we did. The worst spicy rolls the Sushi Toronto team has ever endured, I would say. The Etsu rolls I didn’t like at all either. I can’t describe it, really, but they didn’t taste like anything. Not impressed. The dish you put your name on you want to make something special. I’m not sure what Etsu was thinking on this one. There was a lot of food left over this time. I first thought wow we ordered too much but in reality, it was that we just didn’t want to eat the food anymore. We had to ask the waitress to box it up. In truth, I couldn’t even eat it later so it actually just ended up in the garbage. It wasn’t good fresh so imagine how it would taste a day later! 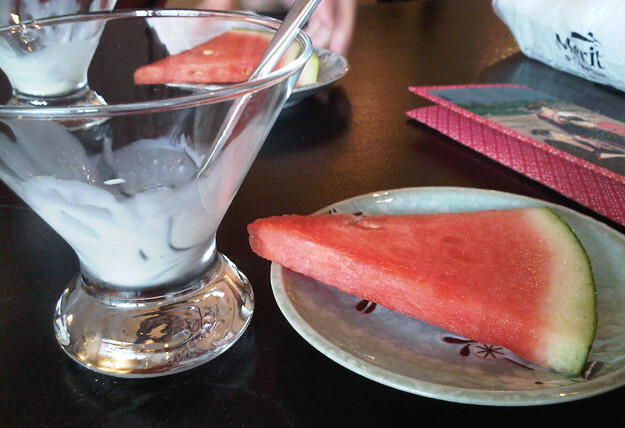 There was one shining moment, food wise: After our meal we were treated to complimentary ice cream and watermelon. Both were good. A nice way to get the taste of those nasty spicy rolls out of my mouth. Yes that was a pleasant surprise. As you know my cardinal rule, an immediate 0.5 bump up in the rating with free dessert! I checked out the washroom this time and also found a few more surprises there. Namely the big bottle of Scope with disposable dixie cups as well as a futuristic digital toilet with all kinds of buttons, etc! When I came back, I had to tell you that you needed to see it for yourself! 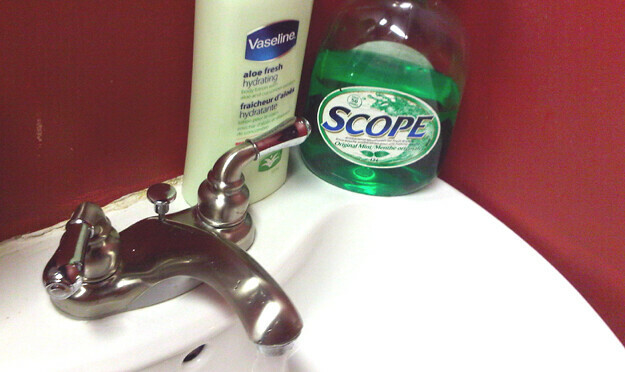 … and indeed I did — with Blackberry in hand so I could snap some pix of the beautiful Etsu washroom, complete with Scope! I did not, however, test out the, as you call it, futuristic toilet. It looks like I may have needed to read the manual first. So, Etsu gets full marks for ‘look’ of the restaurant itself. Bonus marks for the bathroom amenities! The service is great and the ‘add ons’ like the free dessert are most welcome, as well. What happened with the sushi, however? Aside from the sushi pizza, I didn’t like much else. Sorry, Etsu: 3.5/10. Everything was good about the place except for the food which is probably the most important part! Even with the extra 0.5 bump, still get’s a 3.0 / 10 from me. Avoid. Another tip, if you see the sushi chef on a laptop, go somewhere else! They should be more concerned about preparing a good meal rather than updating their status on Facebook. Have you tried their Rik’s Roll? OH MY GOSH. Saliva drips out of my mouth like a dog when it’s placed in front of me. It’s that good. I couldn’t disagree with the review more! I’ve never had a bad meal at Etsu. The Volcano roll is a favourite. The Rik Roll is fantastic, too. I will say that some of their dishes are slightly saltier than other sushi places, but I’m way down with that. Often I’ll ask the chef to create something not on the menu that he’s experimenting with, and get unusual and delicious results.